Yesterday marked another milestone in Kevin, Holly, Emily and Katie’s lives – the day they left for their missions trip to South Africa. Joe and I saw the family off at the airport. 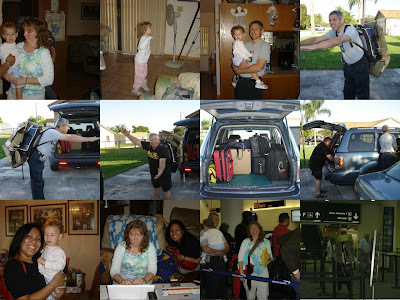 Earlier in the afternoon, we went to Holly’s parents’ house in Homestead. No matter how well-planned a trip may be, those last few minutes before leaving for the airport are the most frantic ones. I know, I’m speaking from experience. You know, those last moments where you try to do so many things at the same time. And that’s how we found the Logans, especially Holly, who in her frenzy, was forgetting where she set some things that she just hand in her hands a few minutes ago. But amidst all these, she still managed to blog! Isn’t that amazing or what? LOL.. In the meantime, Joe and Wayne (Holly’s Dad) were trying to help Kevin figure out how to tie Katie’s carseat onto his backpack. They are hand-carrying the carseat with them. Since they paid for Katie’s seat, she would need it in the plane. Kevin wanted to attach the carseat to his back pack, to leave his arms free to carry one of the girls – just in case they start freaking out, especially during their stopover in Heathrow. After a little strugle, the guys figured it out, but the process was hilarious! Back inside the house, Billie (Holly’s Mom) was already starting to break into tears, as was Holly. I had to get away from them, for I vowed to myself not to cry.. but let’s see what happens later. Finally, off we went to the airport. Kevin had to ride with us while Holly and the kids were in her parents’ car. At the airport, Holly’s parents dropped them off, but not before they said their goodbyes. Holly’s Mom tearfully embraced each one of them. Holly’s Dad did the same, but he told his daughter -“I am very proud of you. I will pray for you everyday.” I thought that was a touching moment; tears began to well up my eyes. Without wasting any time, the Logans proceeded to the queue for check-in, while I stood as their property custodian. I watched their luggage. Except for a minor incident which was remedied immediately, everything was uneventful. (the porter deposited their luggage at the wrong spot. A few minutes later an airport male staff came and told me sternly that the luggage shouldn’t be where they were. The porter came back and moved the luggage, actually to a much better location) After about 30 minutes of waiting, the family was checked-in without a problem. Finally, the dreaded time came – us letting go of our dearest and closest friends to fulfill what God has called them to do. All my life, I’ve always been the one going off and leaving my family and friends behind. But this time, I’m on the other side of the fence; I’m the one left behind. At that moment, I didn’t know what to do. Actually, both Joe and I were at a loss for words too. And as if they have a mind of their own, my tears came rolling down my cheeks (and they still do as I am writing this post). I noticed Joe became misty-eyed as well when he was embracing the Logans. Our intention was to pray for and with them before they left for their gate, but alas, our emotions took over and we weren’t able to do it. (We prayed for them later though). It was hard watching them go. To the Logans – “Auf wiedersehen”, or in literal translation “’til we see each other again”. This German word is an expression of goodbye that is full of optimism for a next meeting. And that’s how we remain – anticipating the next time we will see you. God bless you. We love you. We look forward to your good reports from South Africa…. and maybe, you’ll also hear from us about the tales of “Our Life Without The Logans!”.